I’m a processing assistant for the Los Angeles Aqueduct Digital Platform project at UCLA Library Special Collections’ Center for Primary Research and Training. Over the summer, I’ll be working with Diane Ward, a graduate student in Geography who will process and create description for the Friends of the Los Angeles River records. FoLAR is an environmental organization working to restore the LA River and its habitat and educate people about the river’s importance. In my work, I’ll digitize documents, do risk analysis, and work on metadata, as well as make the occasional post here. Postcard of the LA River (undated), Friends of the Los Angeles River records (Collection 2215). UCLA Library Special Collections, Charles E. Young Research Library. I’m an undergraduate minoring in conservation biology, so I’m excited to be involved with this project. For my minor, I’m learning about ecology and evolution, as well as ways to conserve and preserve the environment. The FoLAR records show how people might apply concepts covered in my classes, so this project is a great opportunity for me to see how what I’m learning can effect change in the world. 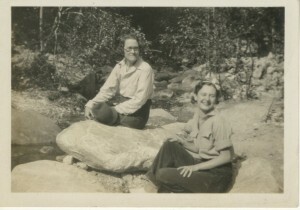 Two women sitting alongside the LA River (1933), Friends of the Los Angeles River records (Collection 2215). UCLA Library Special Collections, Charles E. Young Research Library. During our initial survey of the collection, we found a few items that stood out from the rest: LA River postcards from 1915-1920, photos from the early 1930s, and two railroad spikes, which appear to have been found during a river cleanup. The photos and postcards were unexpected finds that showed a very different LA River than the one we're used to seeing, and it was exciting to happen upon these pieces of history. The railroad spikes were a different kind of surprise. We knew the box they were in contained items found during a river cleanup, but we didn’t know exactly what that might mean. FoLAR has found a variety of things during cleanups. Anything was possible. I don’t know what I was expecting to find in that box, but a pair of railroad spikes wasn’t it. 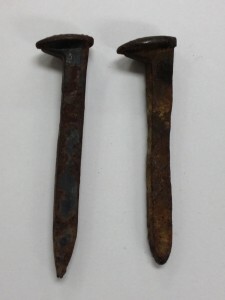 Railroad spikes, Friends of the Los Angeles River records (Collection 2215). UCLA Library Special Collections, Charles E. Young Research Library. About the collection: The Friends of the Los Angeles River (FOLAR) is a non-profit organization, whose mission is to protect and restore the natural habitat and historic heritage of the LA River through planning, education, and stewardship. 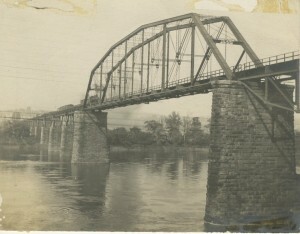 The records of FOLAR document the organization’s endeavors to foster efforts to monitor and improve the River’s water quality, create educational programs, promote sustainable water usage, develop recreational and commuter bikeways and pedestrian paths along the riverbanks, as well as other advocacy efforts. This collection is comprised of newspaper clippings, publications, newsletters, reports, promotional ephemera, board reports and minutes, photographs, and other files generated and used by FOLAR during the course of the 1980s until circa 2011. The FoLAR records (Collection 2215) were acquired in Fall 2013. Processing is on track to be completed in December 2014 and will subsequently be open for research.